So, I'm not sure if you have heard of the book series called the Ranger's Apprentice by John Flanagan. It's a really good series! There are twelve books in the Ranger's Apprentice series and has a related series called the Brotherband Chronicles. Anyways, a friend of mine who I met on Google+, +Alix Oakleaf , started role playing RA (Ranger's Apprentice) with me. If you don't know what role playing is, it's when one person writes one or two sentences and then the other person writes the next one or two sentences. Well, after a while we had quite a story! I mentioned it to one of my friends, and she mentioned that we should put it together and make it into a fan fiction story! We titled it A Tale of Two Rangers. It is still in progress, and we post another chapter every time we finish it. You can find it on fanfiction.net, upliterate.com, or inkitt.com. So, what have I been up to recently? Well, for one writing. NaNoWriMo kept me busy for month of November. And school work. School this year has been a whole lot easier in some ways but harder in others. I am taking Physics, Advanced Literature (British), Economics, and Algebra II at our local co-op. At home, I am doing Understanding the Scriptures and Foreign Language (Korean). For Physics, I have to do science fair. I have decided to test propeller efficiency. It is definitely not an easy or simple experiment but that only means that I get to learn a whole lot. 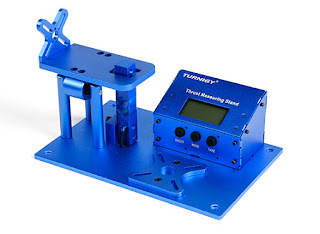 I have bought a Turnigy Thrust Measuring Stand from Hobby King to do the experiment with and so far that's the furthest I've got. I still need to buy more supplies and my science fair mentor, a former Navy helicopter pilot and a really awesome guy, is helping me out with selecting the needed materials. So, I am back...yep, I was the crazy girl with three different blogs and decided to delete them all because my parents said that they didn't want me having pictures up on the internet. So, no pictures, but I have determined to write some more. I have a few reasons for staring up a blog again. 1. I did NaNoWriMo and am working to publish my book. I need somewhere I can advertise it and I guess a blog's a pretty good place. Don't know what NaNoWriMo is? Well, it is National Novel Writing Month. We try to write 50,000 words in one month (November.) If we do, we can go on to publishing our novel. For my Literature class, my awesome teacher gave us a choice between writing a novel or doing a thesis paper. I was really reluctant to try to do this but once I got started, I flew! I made it to 50,000 words with a few days to spare! And now I am working on editing and eventually publishing my book.